Being a denture wearer can be a difficult lifestyle. Dentures are notorious for moving around during eating and speaking. Denture wearers often have to use a fixative just to try and keep the teeth in place. This can make enjoying a varied diet difficult and it can cause embarrassment in social situations negatively affecting your quality of life. 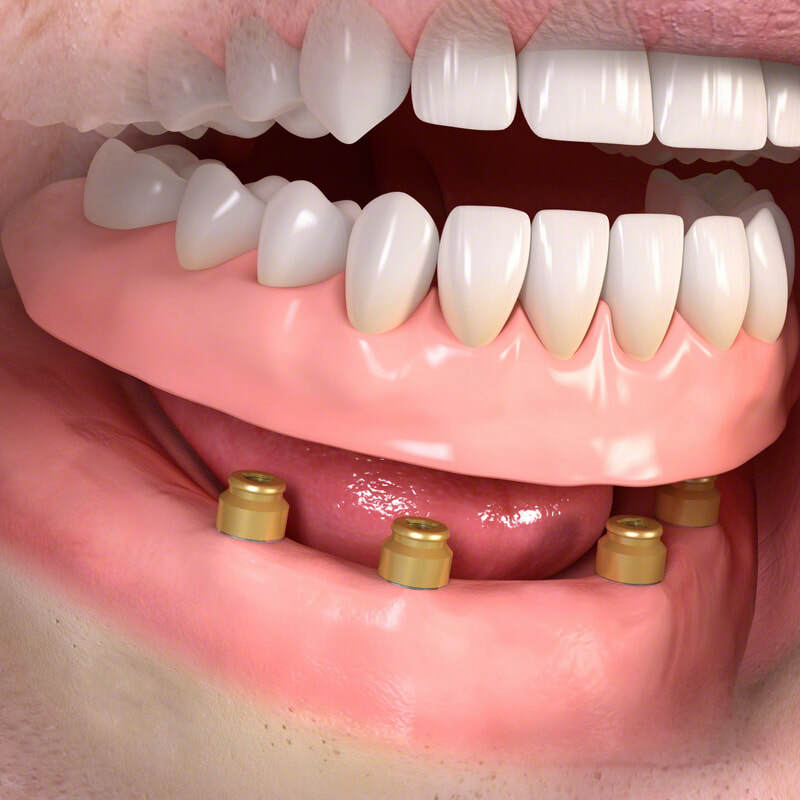 By using dental implants we can provide points of attachments to 'clip' the denture into place, holding it in a firm position and minimising the risk of movement. 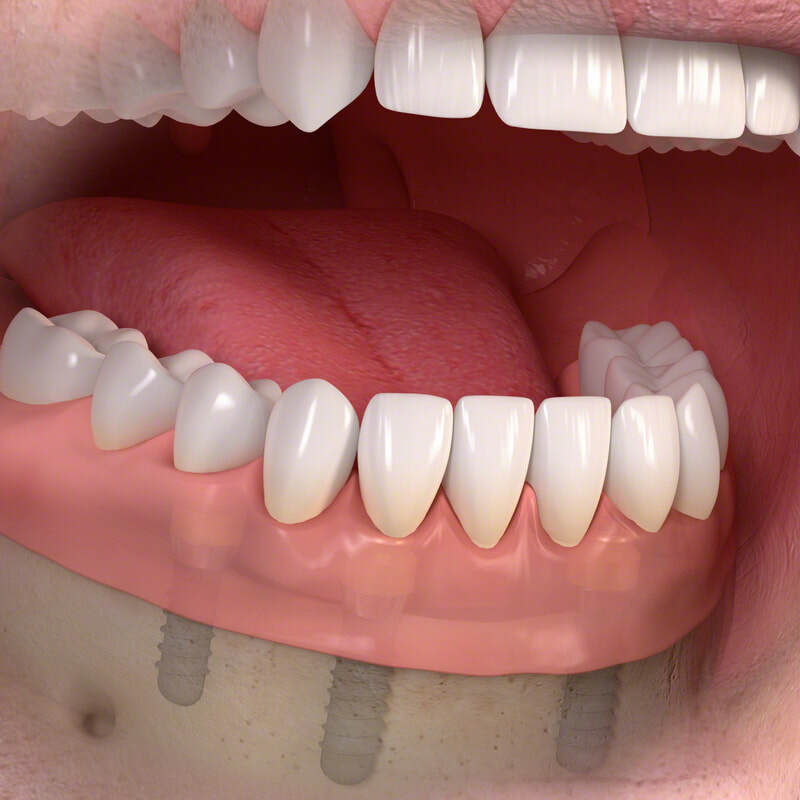 This treatment can truly transform your quality of life and can provide an affordable alternative to implant bridges. 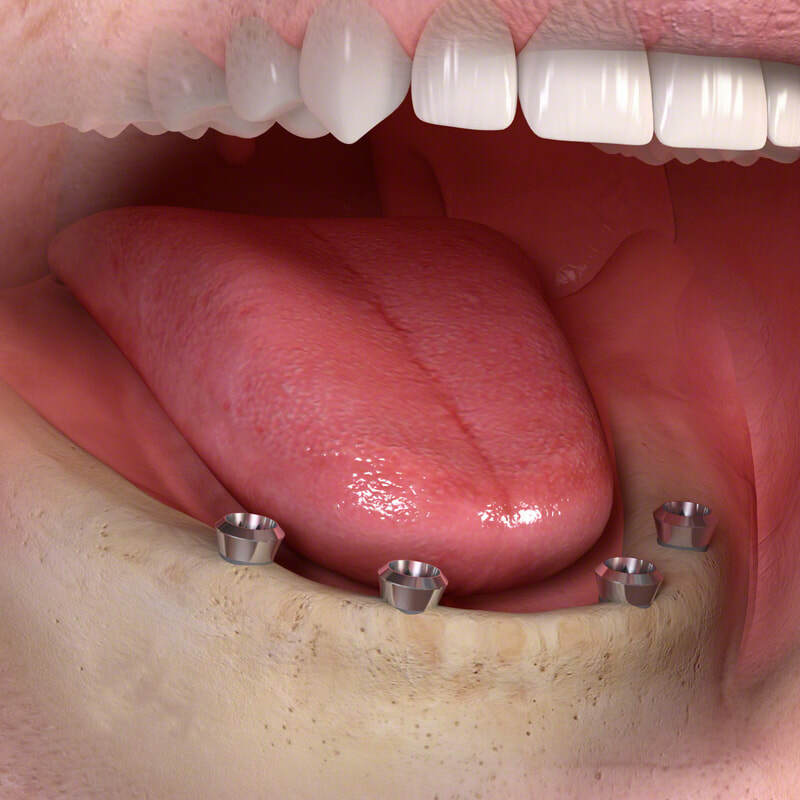 By placing 2-4 dental implants into the jaw we can use these as points of attachment for the denture to clip onto. This holds the denture in place without the need for messy fixative. The denture remains removable but you can live your life free from fear that it will slip or fall out. There are two methods for stabilising a denture. The first involves using direct attachments and the second requires fitting a custom milled bar. Each method has different clinical applications and deciding which method is appropriate in your case will be based on an assessment of your mouth. The number of implants used will again depend on the surgeons assessment of your mouth and the availability of healthy bone height and volume which will be assessed by a 3D x-ray (called a cone beam CT scan). 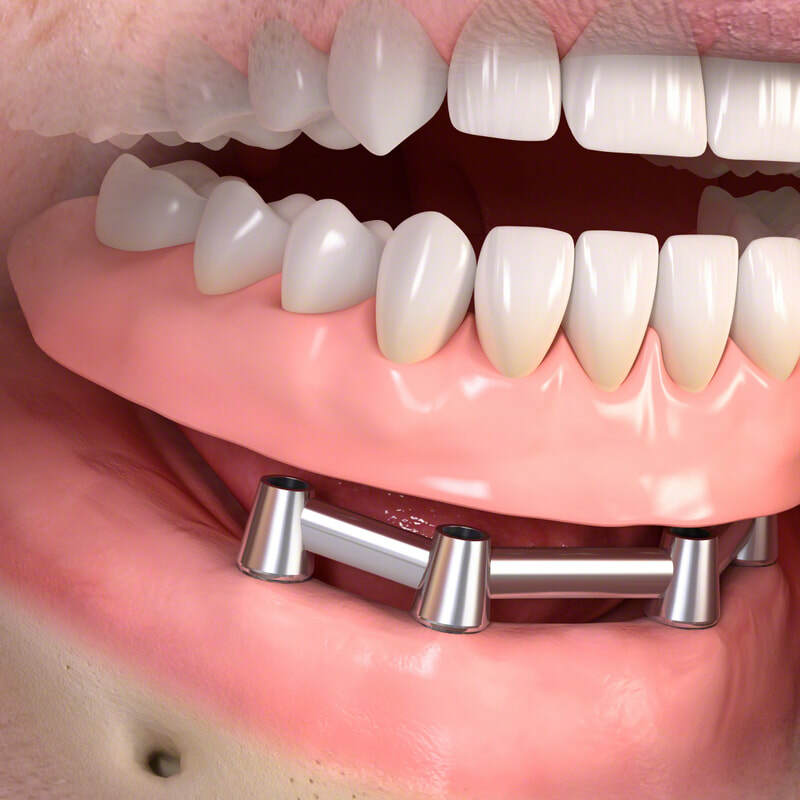 2-4 implants are placed, connected to direct attachments (called locators) to clip onto the denture which is then held firmly in place. 2-4 implants are placed and stabilised by a custom milled bar which then forms a point of attachment to hold the denture firmly in place. Denture stabilisation involves placing 2-4 dental implants which can then be used as a point of attachment to hold the denture in place. 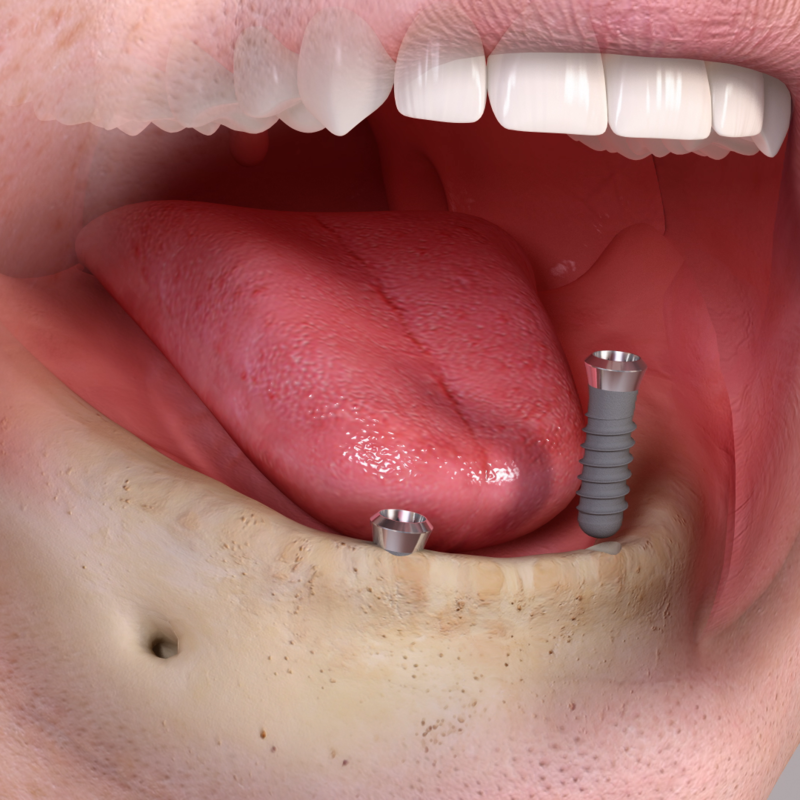 The dental implants are placed gently and precisely into the jaw. 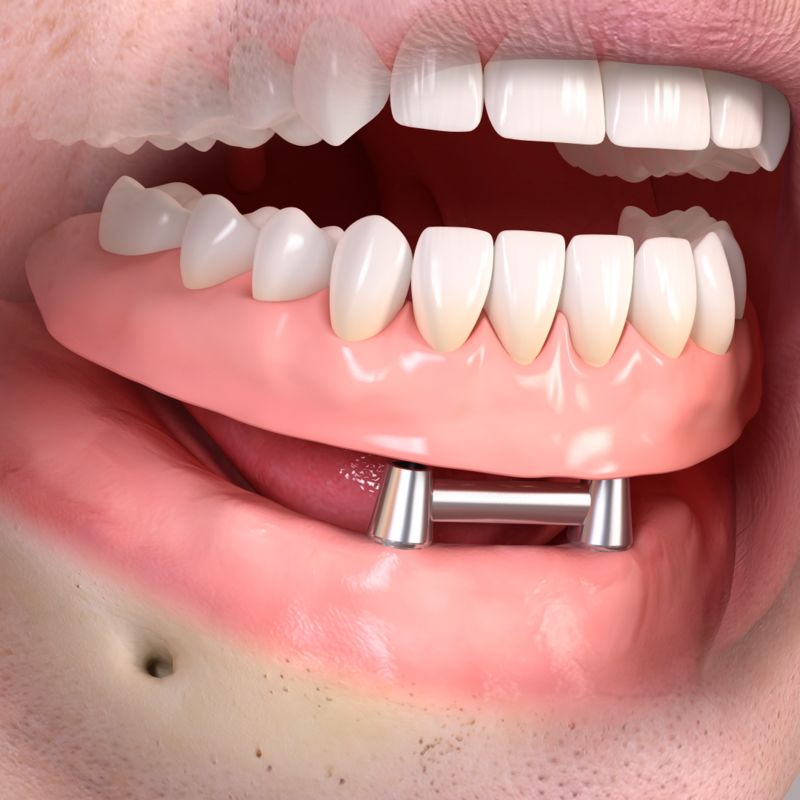 After a period of healing the implants can be attached to either attachments that clip into the denture or in some cases a custom made bar that then supports a denture. 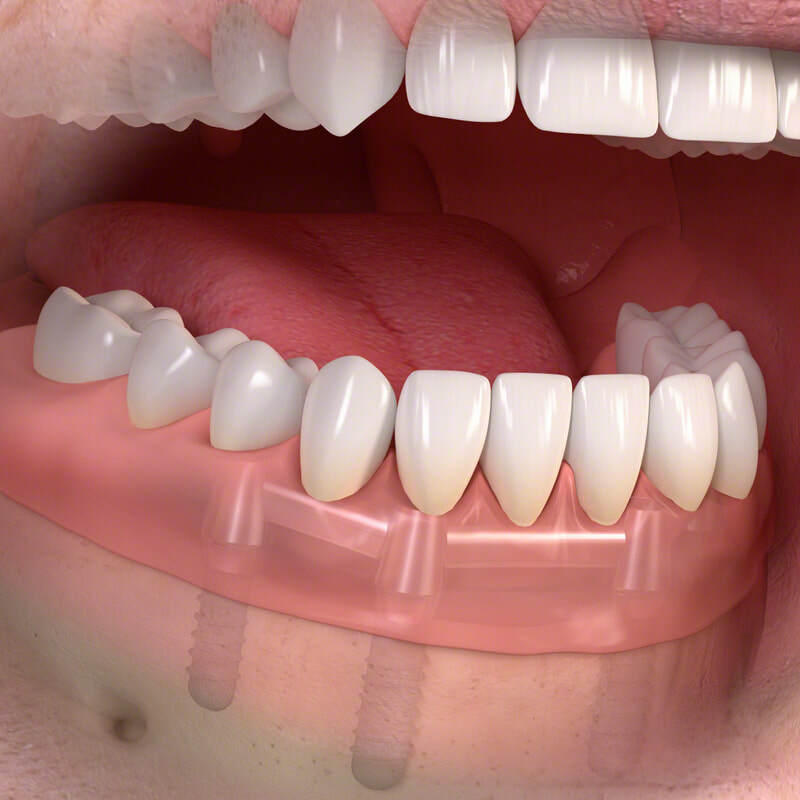 This allows the denture to be stabilised and held firmly in place whilst still being removable. The first step in your journey would be to attend a consultation to discuss your individual needs and expectations, this is an opportunity to get an idea of the different treatment options, the process and the possible costs involved. This is a complimentary visit where one of our dedicated Implant Co-ordinators will guide you through the process and answer all your questions. Your surgeon will spend time talking with you about your needs and options. You will have a full clinical assessment of your mouth, teeth and gums including photographs and any necessary x-rays. This assessment will allow your surgeon to formulate a bespoke treatment plan. Once you are ready to proceed with treatment we will start the process of planning, this will involve taking a series of impressions, photographs and possibly a 3D scan. This phase is essential in allowing your surgeon to precisely plan the optimum position of your implants and the design if your final teeth. Once your treatment has been planned we can then go ahead with placing the dental implants. The implants are placed gently and precisely and left to heal for a period of 8-12 weeks. In some cases it may also be necessary to carry out some bone grafting around the implant sites and in most cases this can be done at the time of implant placement without drastically increasing the cost or time-frame of treatment. Surgery is straightforward and can be carried out under local anaesthetic, if you are particularly anxious we can carry this part of treatment out under conscious sedation. Recovery is usually very quick and straightforward and you can continue to wear your existing denture during this time. Once the implants have healed and are well integrated within the jaw bone we can start the process of attaching the denture. 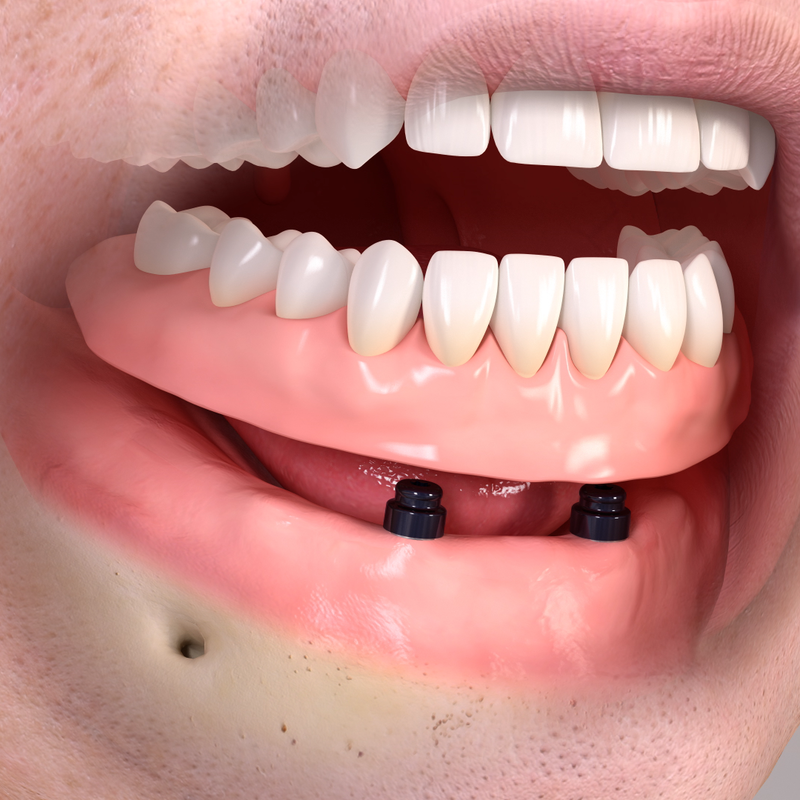 In some cases it may be possible to convert your existing denture otherwise we will need to construct a new denture, this process generally takes around 4-8 weeks. The length of time your treatment will take will depend on a number of factors and is different for everyone. On average you can expect this type of treatment to take 3-6 months from start to finish. 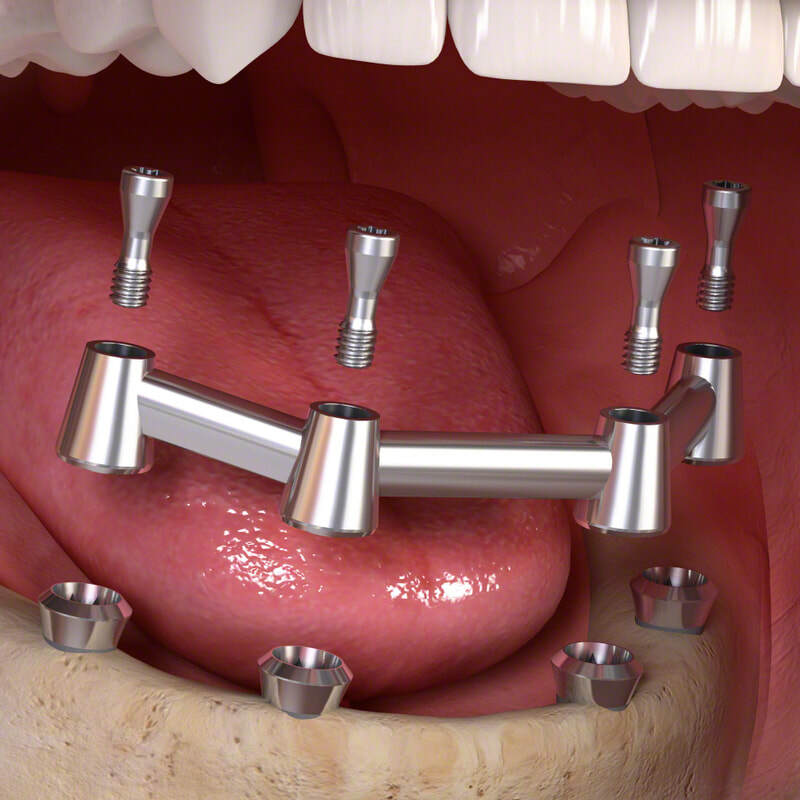 Dental Implant treatment is very comfortable and most patients report feeling no pain. The surgical procedure can be carried out under local anaesthetic and is very similar in recovery to having a tooth extraction. For the first few days after surgery you can reasonably expect to have some minor discomfort and in some cases some bruising and swelling but this is usually minimal and can be easily managed with over the counter pain relief. If you are particularly anxious we can use conscious sedation for the surgical procedure, this involves giving you some medication to help relax you and make you feel less anxious and less aware of the procedure. 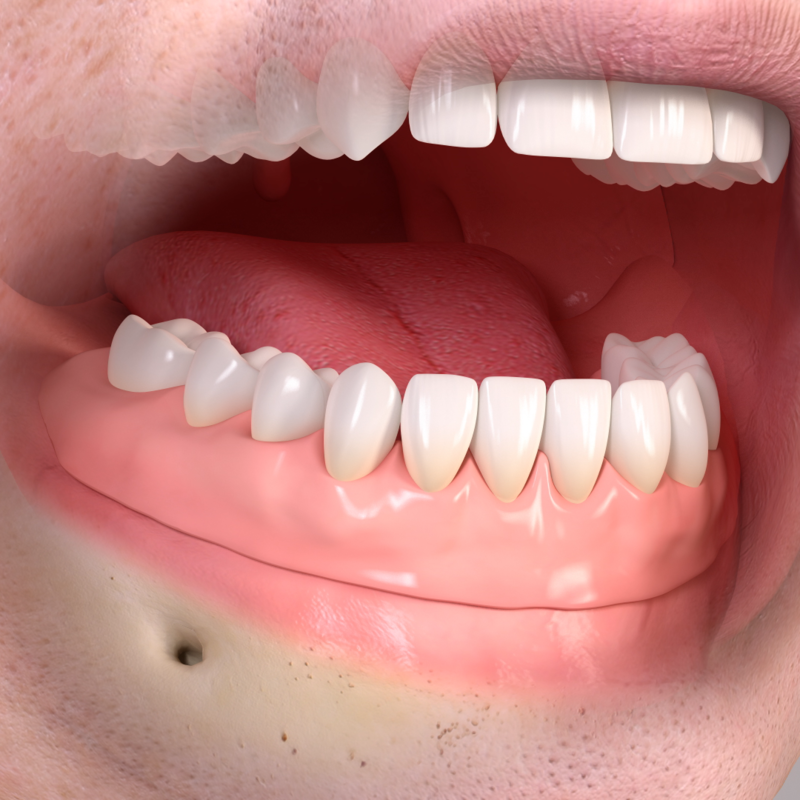 How much does Denture sTABILISATION COST? These fees are provided as a guide only, your treatment will be planned on an individual basis to meet your own personal needs. We can provide payment plans (subject to status) to help spread the cost of treatment. We meet very few people who are totally unsuitable for implant treatment. Certain medical conditions and lifestyle choices can impact the success of treatment but usually, with proper management, this can be mitigated. In some cases an individual may not have sufficient bone available to support the implants and if this is the case there are things we can do to get around this. Whilst it does not mean you cannot have implant treatment, it does mean that the process is a bit more complex, will take longer and in some cases it will increase the overall cost. The best way to find out if you are suitable is to get in touch and book your free consultation to start your implant journey.